Firstly, thank you for taking time for visiting and reading this page. The fact that you are here means that you are either looking for change or ready for one. Acknowledging that you need support is not an easy task. Hence, irrespective of what you do from here, you should most definitely give yourself a pat on the back now for taking the positive initiative. Because you invested time in finding my site, I believe it is only right that I should return the favor by sharing with you sequence of events that brought this work to life. My trading career started not long after I read the book “4 Hour Work Week” by Tim Ferriss. Although the two events were independent, I thought it was a great book for me as I was at the cross-road in career – I was soul searching and I was asking questions that no one, except myself, could answer them. Don’t get me wrong, the book did not miraculously give me the answers. However, it gave me the framework I desperately needed to rationalise my thoughts to find those answers within me. Once I saw the light bulb, my purpose and drive for trading became very clear. I knew what I had to do and I was not easily influenced. Always finding an excuse why trading did not go well. 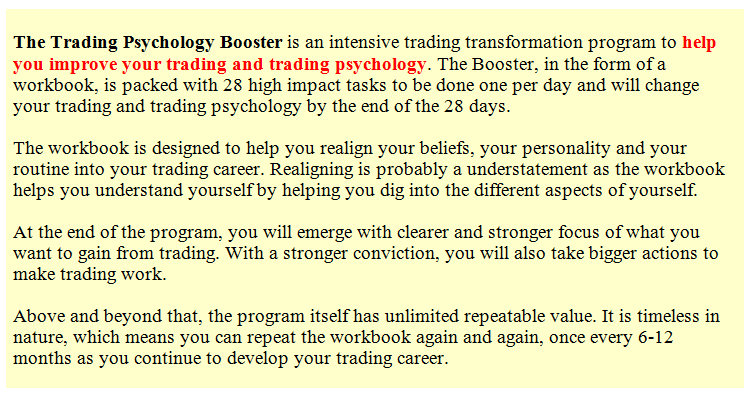 Most common among them is, How to get help on Trading Psychology? I tried encouraging these traders to read Tim’s book but I realised that they needed something more specific. Hence, I started working on some ideas and went on to develop my own “guidelines” to help others. After helping a few traders with it, I found them useful. One thing led to another, and since then, I have been working on various methods to resolve different psychological and trading issues. 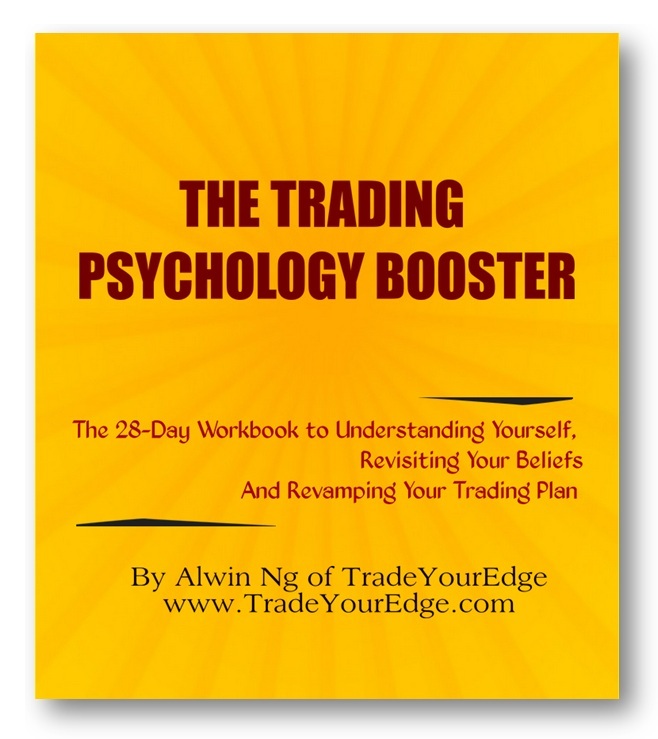 The result of that – The Trading Psychology Booster (TTPB). TTPB is a fusion between what Tim wrote and what I personally feel was important in trading. I noted down all the issues that traders had and spent several months re-organising ideas into something that would be reader friendly. You might buy this now or you might buy this later. However, the key point to note is this – please don’t overlook the importance of understanding yourself in relations to what you want to achieve in trading. Many traders fall into this trap, get slapped by the market before coming back to this subject. To be honest, why be like them, why not take a different route and start now. After all, this is sold at a reasonable price and it could potentially save from your from losing a lot more. 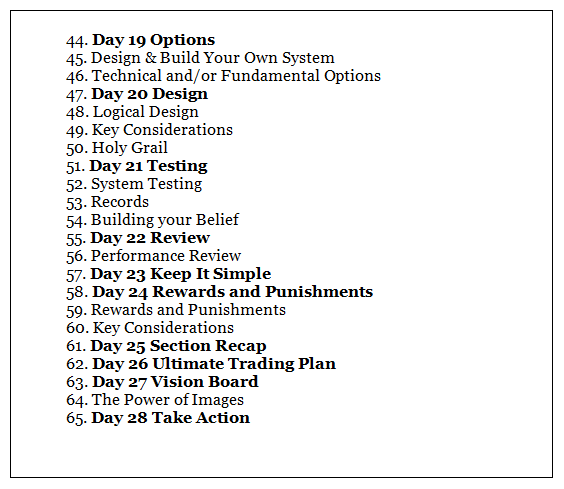 Anyway, make sure to mark this page and get a copy as soon as you realise what I’m talking about here, TTPB will be a powerful tool to help you grow and develop your vision for success. Lastly, I wish you nothing but success in your trading career. Thank you once again and have a good day. A simple introduction and some basic framework to help you get the ball rolling. 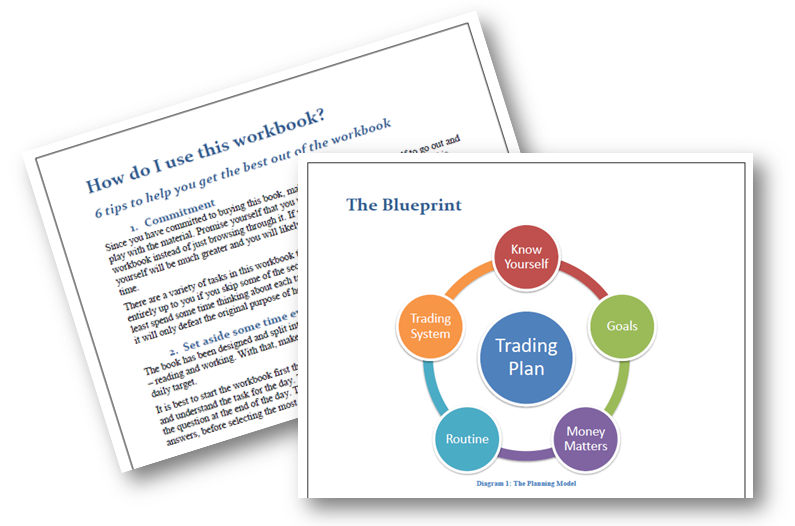 Section 1 is all about knowing yourself as a person, a trader and an investor. Knowing about yourself is the best place to start a review of your trading career. Is it also the most underrated. Once you know about yourself, the next thing to find out is where you want to go. A review of your relationship with money and how much money you require will give you necessary road map to success. Trading is about being there at the right time and right place. If you have the right routine, you will be there when you need to be there. 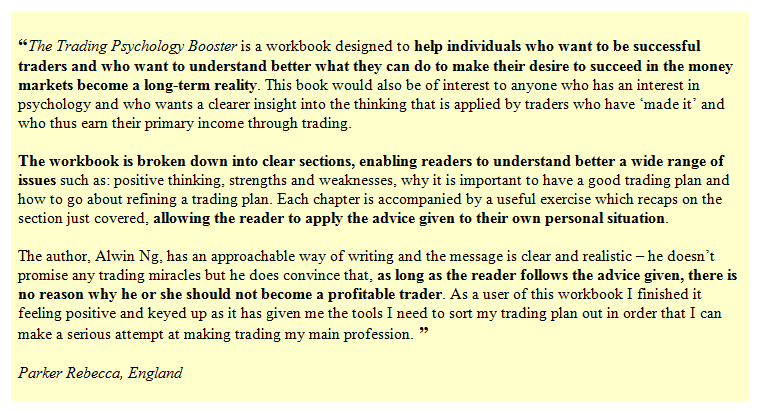 A trading system should be one that resonates with you. The long desired Holy Grail is a system that is in sync with you. This is where every puzzle is being put together. 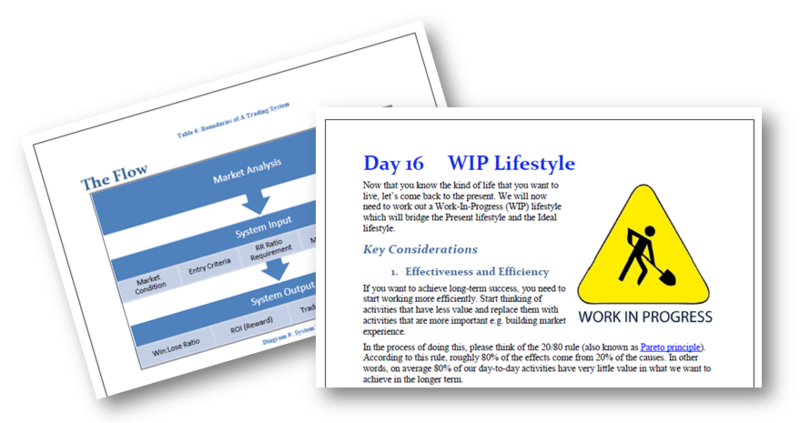 Every part of the workbook needs to be in confluence with each other to create the Ultimate Trading Plan. 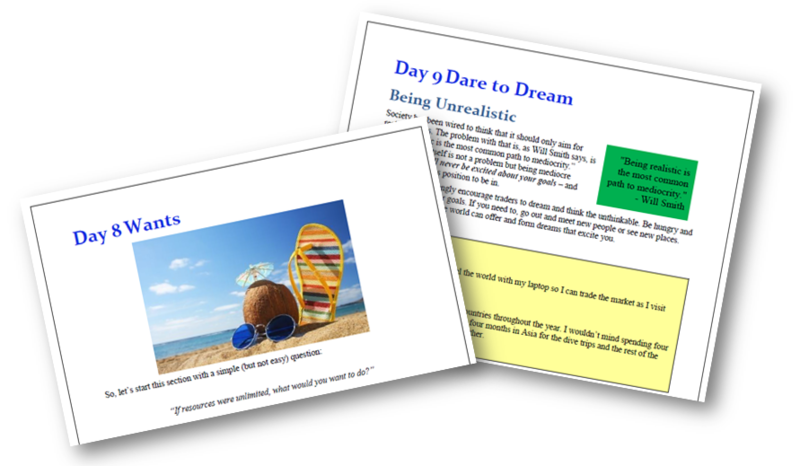 Some hints and tips to help you maximise the potential outcome of the workbook. 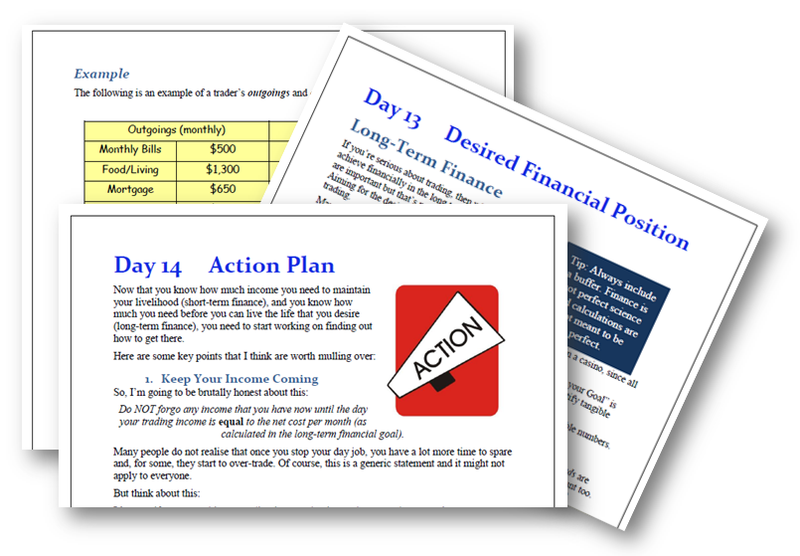 The Blueprint is the framework used for the entire workbook. 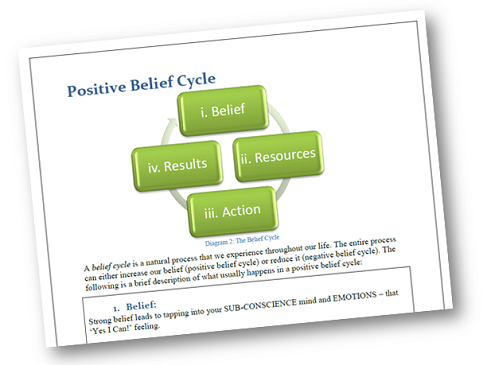 Belief Cycles are crucial for your Trading or Day-to-day psychology. Wants and Dreams are the source and drive to achieving great goals. Unfortunately, many people do not take time to understand what they are. Many aspire to achieve Financial Freedom. However many have no real idea what their Financial status are. Left: If you do not fully appreciate a trading system, then if will not fully serve your needs. Right: Having a routine is crucial to achieve consistency. In case you didn’t know, I’ve created an updated version of this workbook. 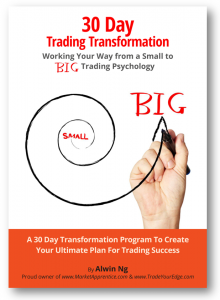 30 Day Trading Transformation (30DTT) is an updated program with new techniques. Both of these books are great but 30DTT is a new and improved version of TTPB with more high impact exercises incorporating NLP concepts. Check out the 30DTT Today – CLICK HERE!